How We Roll, March 16: what impact may Metro’s potential ballot measure have on traffic and development? In addition to comments on the blog, following Metro’s general Twitter feed is a good way to learn about the system and see what others are saying. Looking west at the Expo Line and a new development rising adjacent to Culver City Station. Photo by Steve Hymon/Metro. The headline doesn’t really indicate the depth of this very smart and well-written article, which takes a sophisticated look at the age-old local question of whether transit can fix traffic. There is some strong reporting about the run-up to this Friday’s release of the spending plan for Metro’s potential ballot measure, with many signs pointing to its great ambition and scope. If it passes, the plan would create something like a real workable transit system, which hasn’t been seen in Los Angeles for generations. But that’s if it passes. It first must get support from two-thirds of the county’s voters, which will be difficult. Transit planning is also land-use planning. Wherever new tracks are laid, developers are encouraged to follow. A vision for a new transit system is also a vision for reshaping communities throughout the county. The idea is that building high-density projects around stations creates walkable neighborhoods and lessens the impact of traffic while providing much-needed housing. But wherever this theory is applied, it seems to generate a backlash. Reporter Gene Maddaus looks at current and potentially future communities on the Metro Rail system — Culver City, Leimert Park, Cudady and Pasadena — and how the above issues apply in those places. But what about the big question? Does transit fix or ease transit? Gene finds the answer to be murky, though suggests that transit certainly creates more options for getting around and can accomplish some other worthy goals. Very interesting as a ballot measure about traffic and development near transit in the city of L.A. would not be put before voters in November, when voters may also be considering Metro’s potential ballot measure. The Metro Board will decide in June whether to go to voters with a sales tax increase and extension. The 5 freeway in 1967, perhaps happier and definitely smoggier times. Photo: Eric Fischer, via Flickr creative commons. The traffic data firm Inrix has certainly learned from the Texas Transportation Issue and other similar firms: producing regular reports on traffic hotspots in the U.S. is a good way to stay in the news. Not to diminish the latest results, which suggest that when it comes to average hours-of-delay experienced by motorists, the Los Angeles region has again pulled ahead of the Washington D.C. area. Obviously in a county our size, traffic is a very local thing and a cool map with the article vividly shows that if you don’t like traffic, it’s probably best that you don’t rely regularly on the 101 and 5 corridors stretching from the western San Fernando Valley to the L.A.-Orange County border. The takeaway: a stronger economy seems to be playing a role. I’d suggest another takeaway: with traffic bad in 2015 and the county likely to grow population-wise in the coming years, it may be smart to keep investing in alternatives to traffic and trying to fix some of the obvious bottlenecks in the road system. And now we pivot to another key topic, perhaps one that Blue Lines became acutely aware of again yesterday afternoon: the importance of maintaining transit in a state of good repair. An electrical fire in a subway tunnel on Monday spurred Washington Metro to make a surprise announcement on Tuesday about today’s closure, with the agency saying it wanted to inspect 600 miles of cable before possibly reopening on Thursday. There has been a series of safety-related issues on the subway system in recent years. In Jan. 2015, one person was killed and dozens others injured when smoke filled a rail stations. A subway crash in 2009 killed eight riders and a train operator. 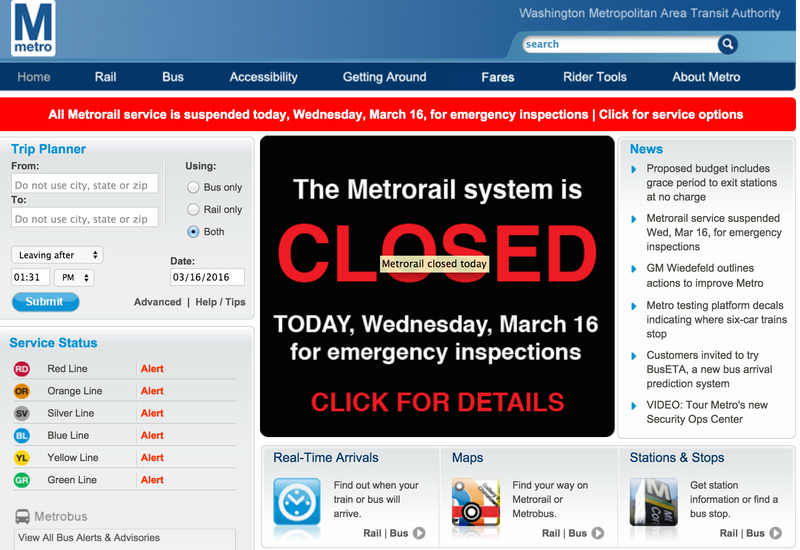 The D.C. area wasn’t consumed entirely with gridlock today, according to the Post. But the long article has plenty of anecdotes from unhappy transit riders trying to use buses or other means to get to work. Related: we know that the spending plan for Metro’s potential ballot measure will include funds for State of Good Repair. 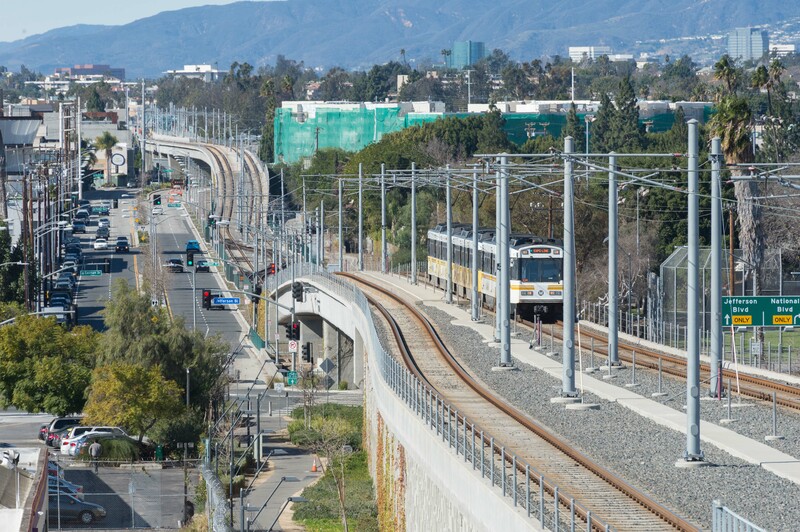 March 14: a skeptical look at the Gold Line extension to Azusa, housing woes in Santa Monica, recommended podcasts for riders who need a diversion. March 11: another Gold Line Foothill Extension review, more ballot measure talk. March 10: take our poll — have you ever seen police give a ticket to driver for a crosswalk violation? What about rising prices, what impact does that have? What about traffic jams? Are they going to be hiring from within the community for new jobs? What type of guarantees do we have that process won’t double, is there a cap placed on the amount a monthly pass is going to cost? Yaroslavsky may be right, in a political sense, that talking about transit oriented development (TOD) is less popular than talking about “traffic relief” from new transit, but he is absolutely wrong to suggest that we shouldn’t be talking about TOD. In fact, if you asked me to rank the problems that are facing Los Angeles County right now in order of importance, traffic would not be at the top of my list. I’d say that the lack of affordable housing and homelessness, the need for decent jobs and the need to confront climate change are all more urgent problems than traffic. TOD is a critical part of the solution to all of those issues. It is also critical to making frequent and convenient transit service financially viable and solving the first/last mile problem. More residents and jobs in a given area means more potential transit riders, and more frequent service, other things equal. Go wait 30+ minutes for a bus in the suburbs and then tell me land use is not a significant factor in making LA transit work. If we’re not ready to acknowledge what needs to happen on the land use side to make transit work, maybe we’re not ready to invest tens of billions of additional tax dollars on expanding the transit system. Plus, we need to be honest about the fact that many people hate policies that would objectively reduce traffic, like toll roads and parking charges, more than they hate traffic itself. In other words, we want to have our cake and eat it too. Talking about traffic relief may be popular, but I think all it does is guarantee that whatever transit project you’re talking about winds up being seen as a failure. The way I see it, in terms of induced demand, getting people off the road and onto transit is functionally equivalent to building more lanes of freeway, because you’re still creating more space on the road for other drivers. They’ll hear that traffic should be going down due to all of those people getting onto transit, luring them out onto the roads at times of day they would have previously avoided due to the traffic. I think the right way to sell it is not traffic relief but rather a way to get around DESPITE traffic. E.g. Expo will not do anything to solve west side traffic (and I think it’s bad that it’s been sold that way), so why promise it in the first place? I think “Santa Monica to DTLA in 45 minutes even during rush hour” has a pretty clear-cut appeal to it that doesn’t need to be gussied up with undeliverable promises. It’s more like 30 minutes on major city streets after 7 or 8 pm ! The suburbs are every hour at the best.